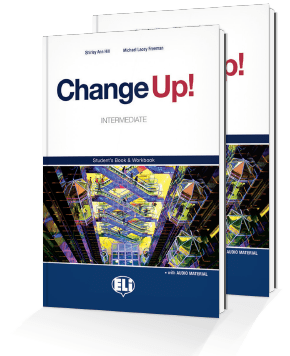 Home / Elt / adult / Change Up! Change Up! is a topic-based course designed to accompany learners in the transition from basic users into independent users of English. The material is structured around three central phases: Experience (authentic texts), Discover (structure of language in real contexts) and Communicate (language in use). 15 units of revision and consolidation of functions and structures. 3 Topics, each made up of 3 Units. 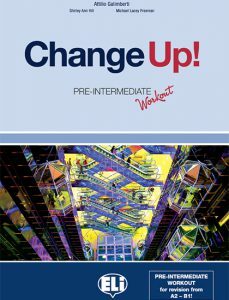 Works towards Certification section prepares for Cambridge English: First. Inward Eye, an approach to literature in English. With and without key / audio transcripts versions. Consolidation of structures and lexis. Writing File: models of written production required by Cambridge English: First. Suggestions for activities at varied levels of difficulty. Answer Keys to all activities. Transcriptions of all recorded material. Intermediate and Upper Intermediate photocopiable testing material. All course listening material in MP3 format.